"Boiling water was used in many ancient wars as a cheap deterrent," Rosh spoke again after a pregnant pause, "but oil was better at killing soldiers." "Oil was expensive and so was less commonly used. But oil of various kinds could be heated to high temperatures and poured over an enemy." "Josephus described its use in the 67 AD battle at Jotapata. Oil, he wrote, easily ran down the whole body from head to foot, under the enemy's entire armour, and fed upon their flesh like flame itself." "But where is Marjina going to get sufficient oil," Isha fretted, "to French fry 37 fully grown men quickly?" "And big enough pots," Josh added, visualizing Marjina deep frying grown-men as French fries. "Can't really fry a dozen gents while keeping the other two dozen waiting!" "Oil's never exactly been cheap," Isha continued, unaware of little Josh's vivid mental imagery. "So people store only a little more than what they usually need in their homes." "Likewise with wood, if she tries to burn them all instead. She'll need heaps of wood." "The Captain's brought a barrel of oil," Hosh offered. "That should be enough for them all. And she shouldn't need that much wood to really heat it up. She could probably cook them all in their own oil." "Mustard oil has a high flash point of 254° Celsius or 489°F, so it will keep burning their skin for a very long time. Not only will it pass most of that heat to their skin quickly, it would also not let their skin cool quickly enough." "That is also why oil should never be applied to burns, as it acts as a heat trap. You want burns to cool quickly. But oil stops that from happening." "Oil was usually used," added Rosh, "to make incendiary devices. Roman-Byzantine armies of the 6th century created 'oil-filled fire-pots', which could be launched by hand or by using ballistae." "During the 1147 AD siege at Montreuil-en-Bellay in France, a cocktail of oils from nuts, cannabis and flax was heated in iron containers. When launched by mangonel, it burst into flames on impact. The Chinese also made early grenades from oil-soaked hemp and cotton, which were ignited and thrown by mangonels." "Boiling the thieves or deep frying them in hot oil would damage them completely and instantly. But they are out of question, as oil is limited and you have 37 deserving candidates, all needing to be served liberally, and at once." "They can't all be burnt alive simultaneously by setting all barrels on fire, again due to lack of wood and time etc. Pouring super-heated oil on them is a viable option, but risky as she'd still be racing against time before they begin to break out and escape from their barrels." "Yea," agreed Isha. "But Oil is dangerous and volatile when heated to high temperatures. It can catch fire and smoke. Since the smoking point of oil is lower than its boiling point, oil is only ever heated and never boiled." "It should be taken off the stove if it begins to smoke, lest it catches fire. This is also the reason why stoves should not be left unattended when heating oil, while cooking at home." "Heated sand," Rosh offered another alternative, "or even dust from the street, could be extremely cheap and effective. It penetrates through the smallest gaps in armor and causes terrible burns." "Sand," asked Josh incredulously, "Really?" "Yeah," said Rosh. "During Alexander’s seven-month Siege of Tyre in 332 BC (now Lebanon), the Phoenicians dropped burning sand down on the attacking Greeks, which got in behind their armor and burned them severely." "Diodorus Siculus wrote that the Phoenicians heated fine sand in enormous shallow bronze bowls. Then they either poured or catapulted the red-hot sand over Alexander's soldiers... It penetrated through the armor into the shirts, burning the body. It could not be helped. They died, going mad with horrible pain." "Prolonged scalding by anything super hot," Hosh agreed, "would result in anything up to fourth-degree burns of the skin. The epidermis and dermis are destroyed, leading to the complete breakdown of subcutaneous fat. Eventually the heat would expose muscle, leading to breaches in major arteries and veins." "Oh fine then," Josh had made up his mind now. "She's going to pour boiling sand on them all. Is that what she actually did, Pa?" "No," Rosh shook his head and continued re-telling the Arabian Nights tale, "Marjina removed the broth from the fire, and fanned the dying flames. Once they were leaping fiercely again, she fed them more logs." "Then she put her largest cauldron upon the fire. Taking her largest pot with a handle, she tiptoed back to the thieves' barrel of oil." "Yay," Josh exclaimed. "She's going to pour boiling oil on the suckers. Not sand! I knew it." "Shsh!" warned Rosh. "You'll alert the robbers with all your yelling. And mind your language. Marjina needs to focus right now. She needs pin drop silence." "Are you Marjina?" asked Josh. "No," said Rosh. "I'm not. But I can't tell you what she did, if you keep startling me with your sudden yells." Josh crept under the duvet, as deep inside it as he could. Rosh continued, "Dipping her pot in the barrel, Marjina filled it up with oil, and took it back to the heating cauldron. She poured all that oil in the cauldron." 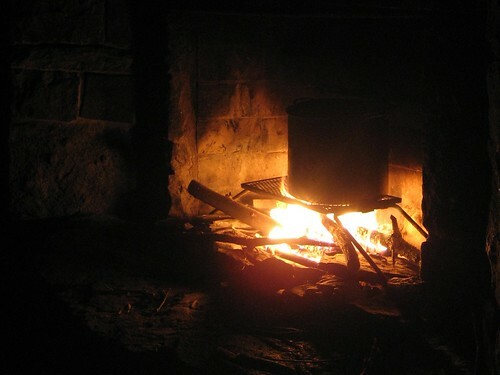 "Again, she went back to the barrel, filled up her pot, returned to the cauldron and poured it in. She made many round trips and continued filling the cauldron till it was full."